Over the next several hours we were driven southwest in 7 air-conditioned 4 X 4’s toward the small town of Jinka, stopping at two local weekly markets on the way. For the photographers the stops were great opportunities to shoot folks as they went about their daily affairs. However, I was a little taken aback by the children who were not shy about touching us. They were especially fascinated by my painted fingernails. 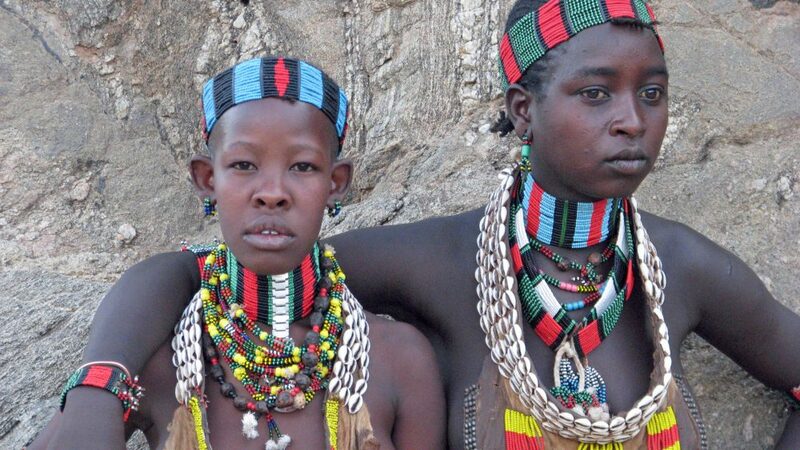 We were beginning to see more and more tribal people in their traditional clothing. And the further south we drove the more people expected to be paid when they were photographed. The going rate is 5 birr or roughly 25 cents per click [now less than 20 cents]. The whole area is undergoing tremendous development with new roads under construction outlined by new metal electric utility poles. 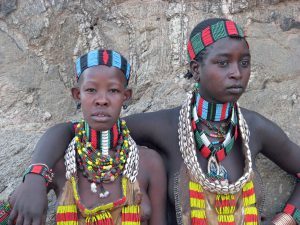 SORC’s activities are not only to research and document the diverse cultures of the Omo Valley but also to offer a center for these cultures to share their traditions, debate their differences, and promote mutual understanding and cooperation among groups that are frequently hostile to each other. Cooperation and understanding are particularly important in view of the radical changes that development, especially tourism, is bringing. In the next decade the goal of the central government is to have a million tourists a year visit the Omo Valley. I have to confess that going through the exhibits, especially the section on the role of women in pastoralist communities, made me very angry, surprisingly so. 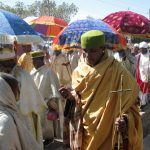 I knew in theory most of the facts about female circumcision and marriage but being physically in the environment where these backward traditions are practiced hit me hard emotionally. Later as we continued our journey, we met people from these communities who are dedicated to changing some of these practices and working with tribal elders to initiate the changes. At dinner that night we were introduced to Lale Labuko, a member of the Kara tribe and the first of his tribe to be given a formal education. 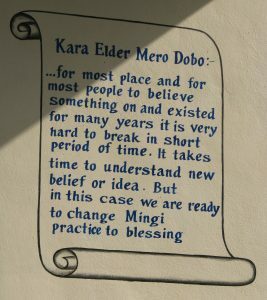 As a teenager home on vacation from school he learned about the practice of killing children considered cursed (mingi). 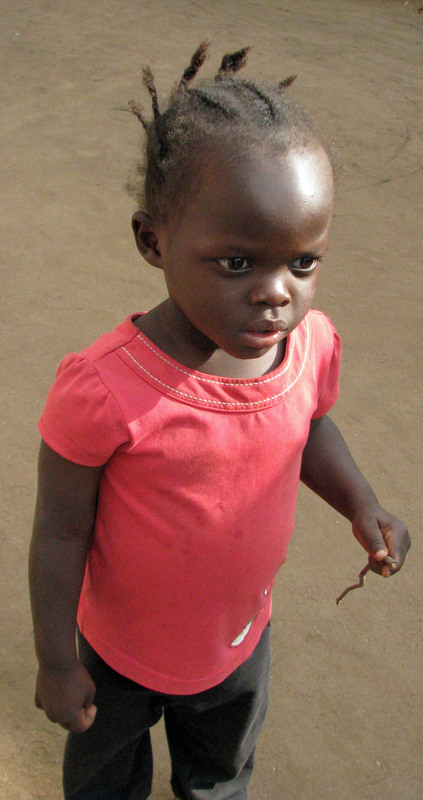 Mingi children are thought to bring bad luck to the community if they are not killed. Lale’s mother told him he had had two older sisters who were killed as mingi. He resolved to do something about this practice when he grew older. 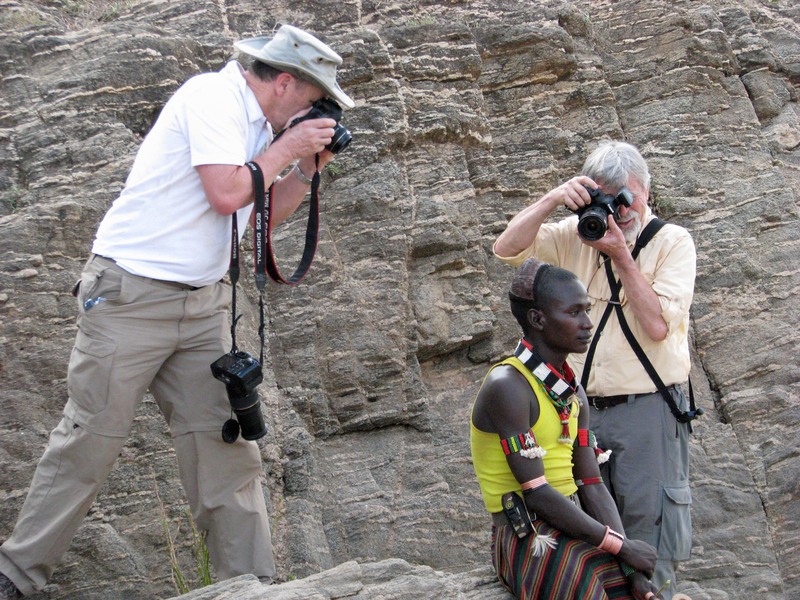 In 2008 with the help of American photographer and businessman John Rowe he co-founded Omo Child. The mission of Omo Child is “to provide a safe, nurturing home and quality education for rescued Mingi children. Our hope is that these children will become future leaders in their tribes and communities. 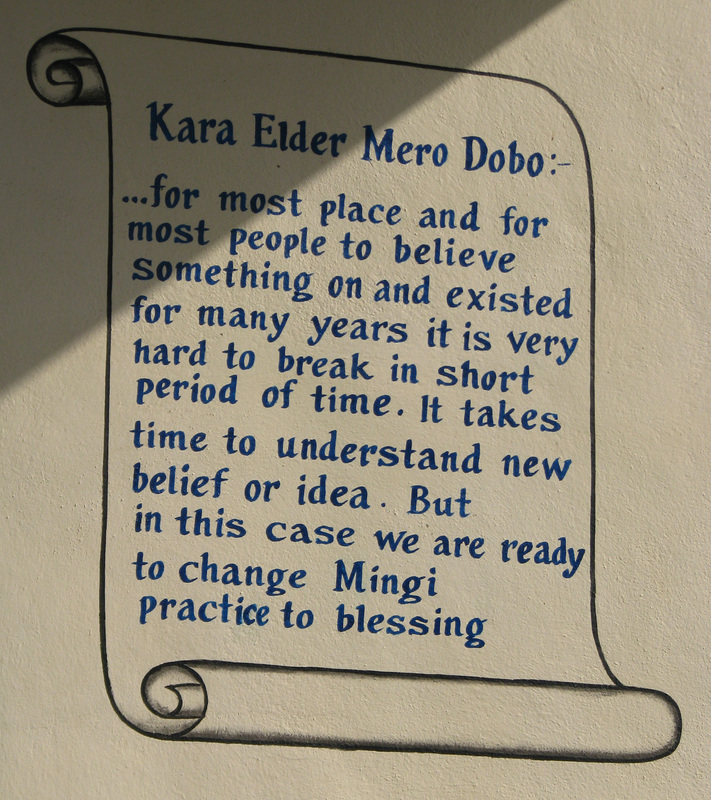 We also raise awareness about the practice of Mingi and work to see it eliminated.” Through the efforts of Lale Labuko and Omo Child the Kara stopped the practice in 2012. The Banna tribe has also committed to ending it. 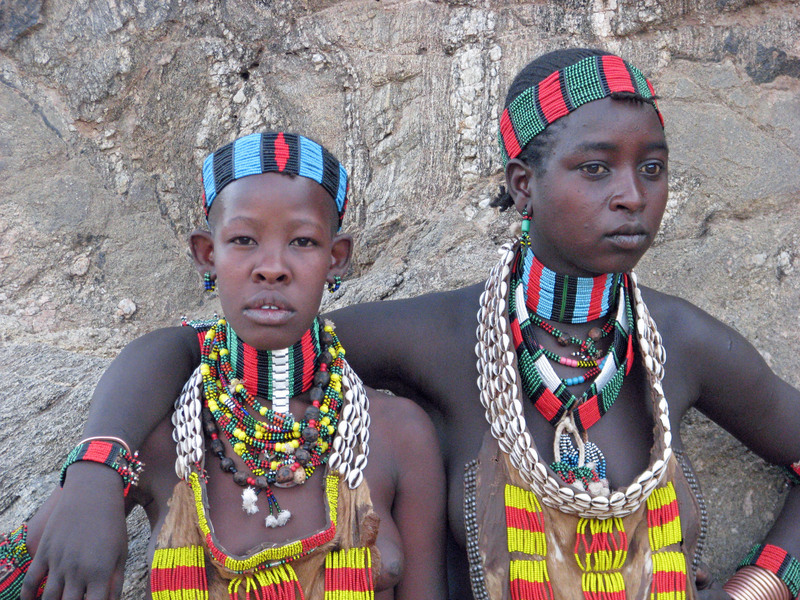 However, it is still practiced by the large Hamer tribe. 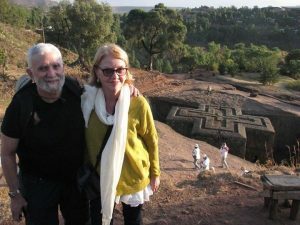 We were scheduled to visit the Omo Child facility the next day. 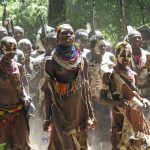 Later that evening after dinner we watched a video documenting tribal conflict among the Mursi and the punishment meted out to the young men by the elders in response to the conflict. 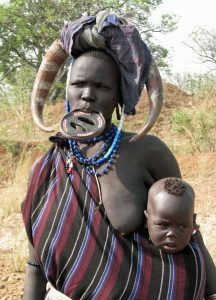 The Mursi are a small group of less than 10,000 and the women are known for their large lip plates. Interestingly, the video was made by a young Mursi man and his brother. The Mursi have an aggressive reputation and, like most of the adult males among the tribes we met, the men are armed with AK-47 assault rifles. The next morning we drove to Militia Village to visit with the Mursi, but before arriving there, our hosts had arranged for a separate photo shoot with some of the Mursi villagers. We were given about an hour to photograph a select group of folks without having to pay the 5 birr per click as we would have to do in the village. Chris kept warning us that the Mursi were a touchy lot who angered easily and that we should be especially careful not to offend anyone. We could see young armed Mursi warriors standing by on the hillside surrounding the shoot. Actually, everyone was quite laid back, obviously used to being photographed. A couple of the women were shyly selling lip plates which I was happy to buy. In Militia Village we were carefully monitored by the Mursi to make sure we paid the 5 birr per click. I had no problem with that, but I wasn’t sure whom to pay when I wanted to take a shot of the village itself. The Mursi like all of the pastoralists in the Omo Valley do not have a masking tradition. 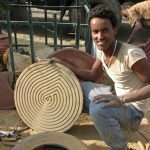 Aside from the women’s lip plates, they also practice scarification and body-painting to decorate themselves. At first it felt a little odd, even exploitive, to be shooting photographs of the Mursi decked out in their tribal regalia, but I shook that feeling off because this was a business arrangement, no different than photographing highly paid models in New York, except these folks weren’t highly paid. However, the Mursi made sure they were paid what was agreed upon. When I shot Noel standing next to a gray-bearded Mursi elder, he made sure I paid him 10 birr, not 5, because gray-bearded Noel was also in the picture. Once I put my camera away, we were able to wander at will without being hustled. We really enjoyed ourselves. In the afternoon we visited the Omo Child facility. The staff person showing us around emphasized that Omo Child is not an adoption agency because the more than 40 children living there are not orphans. 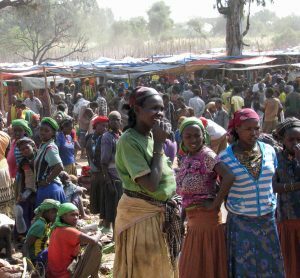 The goal is to integrate these children back into their communities once beliefs have changed enough to ensure their well-being and safety. This is starting to happen. The children are given the opportunity to attend school regularly, girls as well as boys. The hope is that these children, like Omo Child’s founder, will help their generation and future ones successfully transition from tribal Africa to the developed world. We had a long drive the next day to Buska Lodge in the small market town of Turmi. After settling into our rooms, we were treated to a coffee ceremony. Ethiopia is the motherland of coffee where it still grows wild. The stimulating red beans were eaten by nomads living in the mountains. Eventually, its consumption evolved into the beverage we drink today. It owes its popularity to Islamic Sufi pilgrims who brought it back to the Arab world where it spread from there. The ceremony begins with a woman roasting green coffee beans over hot coals in a brazier. When the roasting is done, the beans are passed around for everyone to get a good aromatic whiff. Then the beans are ground with a wooden mortar and pestle. Often frankincense will be burned in the coals after the roasting is over. Ethiopia is a great source for real frankincense. You can buy it from young boys who wave it at you along the road sides. 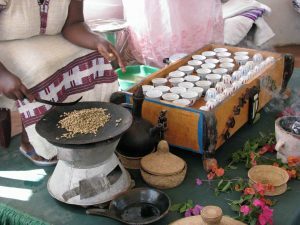 The ground coffee is boiled three times in a clay pot and then poured into cups for everyone to enjoy. Usually a snack like popcorn or, my favorite, kolo (roasted barley) is served along with the coffee. Local health workers often take advantage of the conviviality of the coffee ceremony to discuss issues like family planning. The freshly roasted coffee is so good that I didn’t even need to add sugar. Behind the Buska Lodge is the dry river bed of the Keske where the Hamer people hold their famous bull-jumping ceremonies. If a young Hamer man wants to marry, he has to run four times over the backs of twenty or so bulls that are held in place by men who have successfully completed the bull-jumping. Before the ceremony begins, the sisters and other young female relatives of the jumper are beaten with sticks leaving scars on their backs. The more scars, the higher the status of the women. The beating obligates the successful jumper to care for the women if they ever need help. In the late afternoon our hosts had scheduled a photo shoot with some people from the nearby Hamer village in the dry Keske River but without the bull-jumping.